There are 11 official languages in South Africa which shows the great cultural diversity of the people of South Africa. 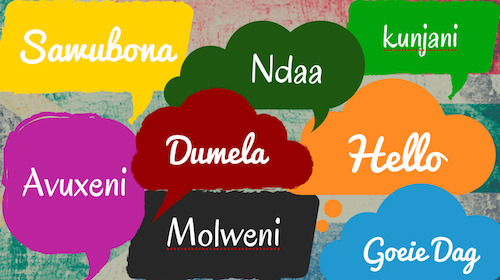 The official languages in South Africa are: isiZulu, isiXhosa, Afrikaans, Sepedi, Setswana, English, Sesotho, Xitsonga, Siswati, Tshivenda, and isiNdebele. The above South African languages and some dialects thereof are used as home languages by the multicultural population of South Africa in the order given above. Although isiZulu is the most spoken African language and is the home language of almost a quarter of South Africans, English and Afrikaans dominate the language use in schools as medium of instruction or in official language in publications such as newspapers, advertising material, books, written instructions, directions and road signage. English is widely recognised in the country as the language of commerce and science in South Africa, however it is only spoken by less than one tenth of the population in South Africa as home language. •	In Cape Town, Afrikaans as well as English are both widely spoken and understood. In the Northern Suburbs, Bellville, Somerset West and along the West Coast, you will encounter many people speaking predominantly Afrikaans, while along the Atlantic Seaboard and in the Southern Suburbs, English is the dominant language in the shops. In schools and business, often people switch between the two languages. •	Afrikaans is the home language of many residents (55%) in the Northern Suburbs around Durbanville and Bellville. In and around the Cape Town metropolitan area 41% of the Capetonians speak Afrikaans at home. Afrikaans is the home language of more than 80% of the Coloureds living in the Cape. Afrikaans is the dominant language also in Muslim communities in Cape Town. •	Xhosa (29%) is spoken in the townships and by predominantly Africans you will encounter in Cape Town. In the Western Cape, most schools teach Xhosa classes in primary school, although the language is less commonly taught at high school level. •	Official documents are usually drawn up in English, some bilingual in English and Afrikaans, official municipal, provincial and national information is provided in all 11 South African languages. •	The languages most widely understood and spoken by South Africans are Afrikaans followed by English. But the languages you will encounter depend on the area you are living in. See our info here in regards to the dominant language used in the various provinces. •	Afrikaans is the third most common language in South Africa and is the only Germanic language with roots outside Europe's borders. It was officially recognised only in 1925 and is a mix of Dutch vocabulary and words derived from German, French, English, Malay and African languages. About 85% of the Afrikaans vocabulary is shared with the Dutch vocabulary! •	Many white South Africans also speak European languages as Portuguese (also spoken by black population originally from Mozambique and Angolan immigrants) German, French, Italian and many more. European languages such as German, Italian, French or Spanish are only very rarely taught at public schools as extramural, and also only some private schools offer a restricted selection of foreign languages. •	Children grow up speaking at least three languages in South Africa. Unfortunately mother tongue instruction in primary school is not available in various languages everywhere, although the locally dominant African language is now compulsory to be taught at primary school level in all public schools. English and Afrikaans are usually taught in schools as first and as second languages. Mandarin Chinese has been introduced in the South African schools curriculum in 2016. More information about the South African education system and education standard. Find more info on nternational schools in Cape Town here. There are many language schools in Cape Town which offer instruction in many local languages as well as foreign languages. Cape Town is also a well-known destination for students and professionals taking holiday language classes to improve their English.